Melt & Pour Soap. Cold Process Soap. COMMENTS: The soaps I made from this mold (with Fresh Cut Grass fragrance) were the first gone from the Christmas tray I made for the angelic doctors and nurses at my son's cancer-treatment center. They turned out amazing, with clear detail, and were very easy to unmold. I would definitely recommend! COMMENTS: This makes a nice bar. Good for small gift bars. "Milky Way™ Bamboo Soap Mold (MW 57)"
COMMENTS: Looked beautiful with the lotus bamboo fragrance and Matte brown coloring. COMMENTS: The soap I've made with this mold has been a customer favorite. I've done a two toned effect with m&p and they were quite lovely. COMMENTS: This bar has an interesting look overall. Nice detail. It comes out of the mold easily. I bought it to make CP with a bamboo sugarcane FO. It is still curing so I don't know how well I will like the fragrance, but the mold is very pretty. COMMENTS: Nice mold that make a very pretty bar. I like to use it with Bamboo Lotus fragrance. COMMENTS: I really love this design. I used MP soap and plastic droppers. First, I sprayed with RA and used the droppers to add green MP to bamboo shoots and edging, let it dry then sprayed again and added the background soap in a beige/brown color. This goes well with any "green type" of fragrance. I used "Bamboo Hemp", which worked out wonderfully. The colors were very complimentary. As expected, plastic molds are handled differently than silicone molds.I find it helpful to make sure you add your MP base all the way to the top edge. Once the soap has hardened I make an air pocket on one side which makes it easier to pop out. It makes a very beautiful soap. 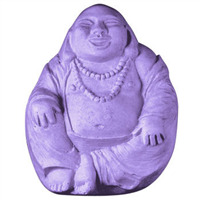 COMMENTS: I like this mold, it has nice detailing and it goes well with my Asian themes soaps. COMMENTS: This plastic soap mold has a wonderful design. MP soap was a little difficult to get out of the mold due to the hard plastic (this is common), but when it released the soap was intricately beautiful. I try to get molds to match my scented soaps. This one was scented with WSP Crafter's Choice Bamboo Lotus. I plan to use this mold many more times for instant eye appeal. I have never purchased a mold from WSP that didn't release. Plastic molds are always a little more difficult for soap to release, but it's worth the extra effort. COMMENTS: This is a thick plastic so don't expect this to be silicone or anything of amazing quality, but for the price this mold is excellent. I just popped out my 3rd batch of M&P soap from this mold with no issues at all. I typically just warm the bars slightly with my hands while still in the mold then push them out with my thumbs. No issues at all. It would probably be easier to dip in warm water but I have never had any issues. 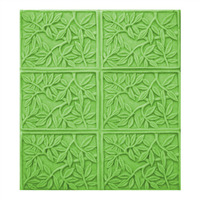 If you want to pay the price for silicone, go for it, but if you are looking for an inexpensive mold with a wonderful design, this one is perfect! "Tough plastic...but makes beautiful soaps"
COMMENTS: I really wish this was a silicone mold and not a tough plastic...it's a beautiful mold!...but can be frustrating when trying to remove soap...and painful on nails to pull on sides. COMMENTS: I love this mold, it makes such lovely looking soaps. 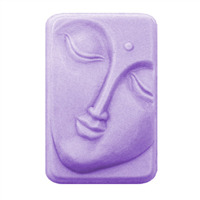 I like to use the Bamboo Lotus fragrance oil with my soaps whenever I use this mold as they go hand in hand! I don't have too much trouble getting my soap out of the mold either. COMMENTS: I've used this mold over and over again. It's such a lovely look for a bar of soap . . . I put it in a cello bag rather than wrapping it so that the detail can be seen. It's been very popular with my customers. COMMENTS: So attractive - everyone loves it! COMMENTS: This mold is physically sturdy with a delicate design. Soaps release easily and the pattern is sharp and clear. A favorite!